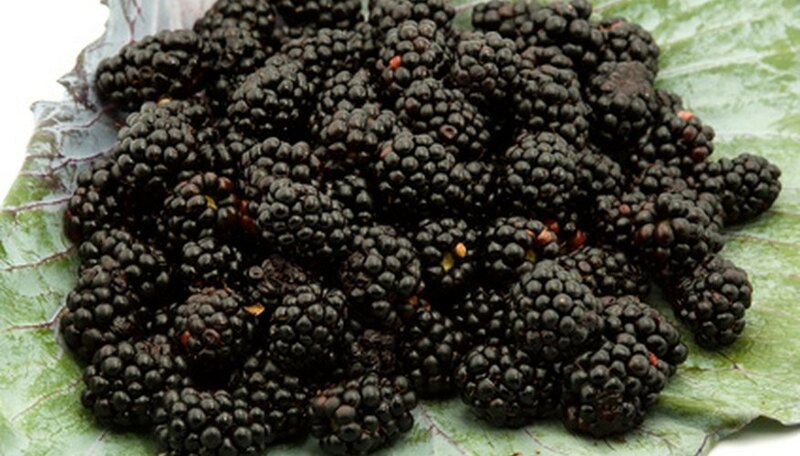 While blackberry seeds are edible, they may be undesirable in blackberry jellies and syrups. The seeds are often so small and there are so many in each berry that complete removal is nearly impossible--but removing the majority of the seeds is usually sufficient. Seeding blackberries is much simpler if you have a food mill. Hand cranked mills are not expensive and can be found where kitchen products and appliances are sold. Electric mills are also available, though they cost more and only save a small amount of time. Cut the stems off each blackberry, then place them in a colander. Rinse them under cool running water. Place blackberries and apple juice in a pot--1 part apple juice to every 2 parts blackberries. The apple juice adds minimal flavor but helps the berries jell better in jam and jelly recipes. Bring the blackberries and apple juice to a boil. Remove the pot from the heat as soon as bubbles start forming. Warming the berries in this way aids seed removal. Fill the food mill intake approximately half full with the warmed berries. Place a large bowl under the mill to catch the seeded berries as they are process through. Turn the crank on the food mill (or turn it on if it's electric). Scoop the seeds out of the mill once all the berries have been processed through. Add more berries and repeat the process until all the blackberries have been seeded. If you don't have a food mill, you can press the berries through a fine-mesh sieve. It won't remove as many seeds as a mill but is suitable for most purposes. Do not use a food mill to seed berries if you wish to use the berries whole. Whole blackberries cannot not be seeded; the process crushes them.